The good news is that there are many products like Naturo Sciences Healthy Skin Restoration PhytoCeramides that can combat the aging process and leave you healthier feeling and looking skin. You just need to find one that utilizes the right ingredients, dosage and price that is best for you. The manufacturer recommends adults take one (1) capsule daily with food as a dietary supplement. The manufacturer does caution to not exceed the recommended dosage. Pregnant or nursing women, children under 18 and individuals with known medical conditions should consult a physician before taking. Internet pricing may vary from website to website. At the time of writing this review this product was found at a price of $24.97 for a bottle of 30 capsules, which under the suggested use should last about one month. The manufacturer says that they offer a 100% satisfaction guarantee. However, no information could be found in regard to this guarantee on their website. This causes a little concern since there could be stipulations that make receiving a refund difficult. 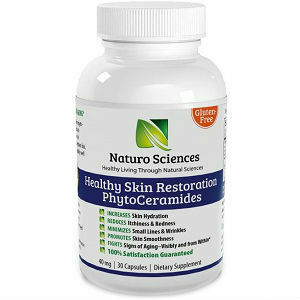 There are a lot of great Phytoceramides products on the market, including Naturo Sciences Healthy Skin Restoration PhytoCeramides. With that being said, when looking at the price of this product, its ingredients and the lack of information in regard to the guarantee. Jack Webster	reviewed Naturo Sciences	on February 4th	 and gave it a rating of 2.